Family gatherings are always a trying time, and many movies have been based around them. 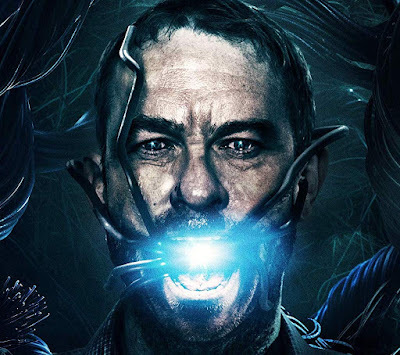 Await Further Instructions starts off with the usual stress and strain, everything heightened by the fact that it's Christmas, and then dives into the realm of the dark and mysterious, with the family suddenly trapped in their home and being given instructions through the TV set. Not knowing exactly what has gone on outside (some kind of viral epidemic, terrorist attack, or whatever else it could be), the family seem to have no choice but to trust the messages being relayed to them, and to act upon them. Some start to think differently, however, and the cracks that were already there under normal circumstances start to widen, potentially leading to more extreme arguments and reactions that could endanger their lives. Sam Gittins is Nick, the young man visiting home with his girlfriend, Annji (Neerja Naik). He hasn't been home in a while, which is surprising when you see how lovely his mother, Beth (Abigail Cruttenden), is. It becomes less surprising when you meet his father, Tony (Grant Masters). And then you have the racist grandfather (David Bradley) to put up with, as well as a pregnant sister (Kate, played by Holly Weston) and her partner (Scott, played by Kris Saddler), who both seem intent on banding against Nick when he tries to ensure everyone acts like civil adults. Everyone survives the first night, barely, and the next day is when they find themselves shut inside their home, having messages delivered to them via their TV. A lot of this movie works REALLY well, because you have a cast doing solid work with a decent script from Gavin Williams (who has one TV movie and a number of shorts to his credit before this). Williams ignores the usual pitfall of this kind of thing (how many times have we watched a slim premise like this padded out by repeated scenes and circular dialogue?) because he's developing things further in between each main set-piece, and there are some enjoyably tense ones here. Sadly, it slips up in the third act, where ambiguity is replaced by a bit too much explanation, although Williams still deserves kudos for firming up a wild idea that he manages to play out in a fairly plausible and intriguing way. Director Johnny Kevorkian does a good job too, especially considering this is only his second feature. This could have easily been a number of annoying scenes of characters arguing against one another strung together, and it obviously cannot avoid those moments here and there, but people are allowed to move away from one another, they're allowed to keep trying to think of all the possibilities available to them, and the simple deviousness of the instructions given effectively reveal a hell of a lot about those having to respond. The women fare better than the men, in the acting stakes, with Naik and Cruttenden the most likeable of the main cast members. Gittins is fine, if a bit bland, and Saddler is given a surprisingly enjoyable character arc, but both Weston and Masters are a little bit too cartoonish with their bad attitudes, and Bradley is sadly underused in his role. A lot of Await Further Instructions makes you think about what you would do if stuck in a similar situation. That's the beauty of it. It's simple and highly effective. When it starts to become more complex, and ambitious, is when it may lose some viewers. But there are worse cinematic sins than trying to become more complex and ambitious than you need to be, and this still deserves to find an audience. Americans can buy it here.